Wiss 8'' Flip Joint Cable Cutters is a 3-in-1 electrician's tool that saves time and money, designed to cut vinyl coated or bare, multi-stranded wire up to size 10/3, using a specially designed cutting knife that ensures sharp, clean cut every time. Wiss Flip Joint Cable Cutters features a handle flips over, turning a cable cutter into a sheath knife. The Wiss Flip joint cutter cables feature induction hardened cutting edges for superior cutting power, smart contour handles for hand comfort when cutting cable and slip resistance for slicing vinyl cable sheath, and sharp edges for slicing vinyl coated cable. Wiss 8'' flip joint cable cutters is a 3-in-1 electrician's tool that saves time and money, designed to cut vinyl coated or bare, multi-stranded wire up to size 10/3, using a specially designed cutting knife that ensures sharp, clean cut every time. Wiss 7 1/8'' industrial straight trimmer is ideal for cutting various fabrics & upholstery. Wiss 8 1/8'' solid steel straight trimmers are ideal for cutting various fabrics & upholstery. Wiss straight trimmers feature precision ground blades for sharper cutting edges & longer blade life. Wiss 11'' straight pattern snips cut straight and wide curves (when trimming light gauge stock). Wiss straight pattern snips cut low carbon cold rolled steel, and are made for plumbing, heating, air conditioning and roofing trades. Wiss 9 3/4'' straight pattern snips cut straight and wide curves (when trimming light gauge stock). Wiss straight pattern snips cut low carbon cold rolled steel, and are made for plumbing, heating, air conditioning and roofing trades. Wiss 8 1/4'' straight pattern snips cut straight and wide curves (when trimming light gauge stock). Wiss straight pattern snips cut low carbon cold rolled steel, and are made for plumbing, heating, air conditioning and roofing trades. Wiss 7'' straight pattern snips cut straight and wide curves (when trimming light gauge stock). Wiss straight pattern snips cut low carbon cold rolled steel, and are made for plumbing, heating, air conditioning and roofing trades. Wiss 12 1/2'' straight pattern snips cut straight and wide curves (when trimming light gauge stock). Wiss straight pattern snips cut low carbon cold rolled steel, and are made for plumbing, heating, air conditioning and roofing trades. Wiss 8'' industrial trimming, grape thinning and orchid snips feature straight, polished blades with an adjustable nut heavy pattern, a coil spring handle opens blades after each cut, and a black baked enamel handle with closing latch. Wiss 7'' light metal cutting snips are used in electronic and appliance light metal cutting, and comes with polished straight blades . Wiss 10 1/4'' duckbill combination pattern snips are popular with home craftsmen and professionals to cut moderately tight curves left, right or straight in light stock low carbon cold rolled steel. 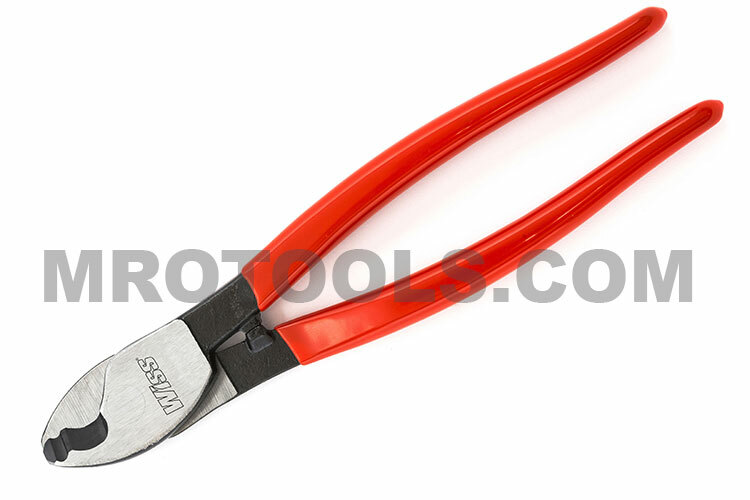 Wiss 13'' duckbill combination pattern snips are popular with home craftsmen and professionals to cut moderately tight curves left, right or straight in light stock low carbon cold rolled steel. Wiss 12'' lightweight aluminum handle snips features a 3'' cut length sleek head design that reduces cutting effort by allowing easy flow of material while cutting, and construction for easy and quick blade replacement. Wiss 13'' offset lightweight snips features a 3'' cut length that cuts straight and left curves. An offset head design allows for easy flow of materials while cutting. Wiss 14'' lightweight aluminum handle snips features a 3 1/4'' cut length sleek head design that reduces cutting effort by allowing easy flow of material while cutting, and construction for easy and quick blade replacement. Wiss 16 1/2'' bulldog pattern snips for Industrial use feature greater cutting power for notching, nibbling and chopping heavy stock, and rust resistant blades individually hand edged for maximum cutting efficiency of low carbon cold rolled steel. Wiss 14 1/4'' industrial offset/bent pattern snips grips for industrial use feature offset blades keep hands clear of metal. Wiss snips feature blades individually hand edged for maximum cutting efficiency that cuts low carbon cold rolled steel. Wiss 14 1/2'' straight pattern industrial snips are used for straight cuts and wide curves (when trimming light gauge stock)of low carbon cold rolled steel. Wiss 7'' utility snips feature a titanium coating that is 3x harder than steel for longer life, spring-loaded blades for reduced fatigue on repeated cuts, precision ground blades for smooth cutting, and wider, heavy duty premium grade stainless steel. Wiss EZ utility snips feature strong, high quality stainless steel blades for corrosion resistance, textured, molded handles for secure, comfortable grip spring assists action minimizes fatigue.